KwalityHost.com Review 2019: Is KwalityHost.com a Good Hosting? Based in India, KwalityHost offers domain registration, shared Linux and Windows hosting, VPS, reseller packages, email servers besides web design and app development to many local services and IT firms in Mumbai, Jaipur, Bangalore and many other cities. It has over 900 local and international customers and the numbers keep growing. KwalityHost is a fully-fledged hosting company that powers over 3,000 personal and business websites mostly in India. Its service offerings include web hosting, domains, emails, virtual servers, and premium SSL. Aside from hosting, KwalityHost also provides Android app development and custom website development using .Net, JSP, and PHP. Starting a business website or e-store is never easy especially if you don’t have the right tools and resources. 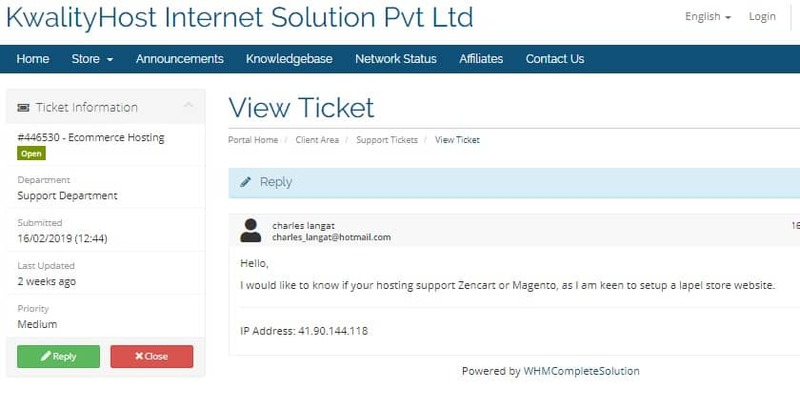 KwalityHost provides out-of-the box solutions such as osCommerce, CubeCart, and Zen Cart which users can deploy with a few clicks. Add-ons such as private SSLs and dedicated IP addresses are available too at fair prices. Even though Kwality Host powers over 3,000 websites, it’s managed to maintain an impressive uptime guarantee that’s just shy of 100%. The magic behind its enviable uptime is a combination of Xeon-powered servers connected to RAID and superfast bandwidth speeds, which guarantee faster response times. With daily and weekly server backups, KwalityHost ensures that customers’ data is secured in multiple locations. Automated backup scripts ensure that all the key files, folders, and databases are copied and stored in a secure manner. In the event of an accident, you can easily restore all key information in a matter of minutes. When it comes to security and access, customers have a number of good options. For instance, they can deploy anti spam & virus protection for their emails and password-protect their website directories. But that’s not all. They can also use Hotlink & Leech Protection, block suspicious IP addresses, and import files via secure FTP access. Managing your website, emails, and databases shouldn’t be a problem because Kwality Host gives users familiar and user-friendly control panels. Windows users have Plesk while Linux customers, cPanel. For those who haven’t used it or just want to have a feel, be sure to check out the demo. Accessible from any browser, both are packed with nice features and web administration options. Switching from Rupees to USD, I realized just how cheap KwalityHost Linux/Windows packages are, the 3% processing fee notwithstanding. Four billing cycles are available; monthly, quarterly, semi-annually, and annually. Every plan is backed by a 30-day money-back guarantee, which means you can opt out if you’re not happy. I opened an inquiry ticket as I was interested in knowing a little more about their e-commerce solutions. 48 hours later (at the time of writing this review) it was still pending, which speaks volumes about how slow ticket support is. The other support channels include live chat and telephone, though you can also reach the customer support team via Facebook messenger as well. With over 10 years of hosting experience, KwalityHost offers customers some of the cheapest hosting packages in the Indian market, an easy-to-use hosting panel, and friendly-support. Wondering how KwalityHost.com stacks up against other Web Hosting companies? Enter any other Web Hosting company and we will give you a side-by-side comparison.